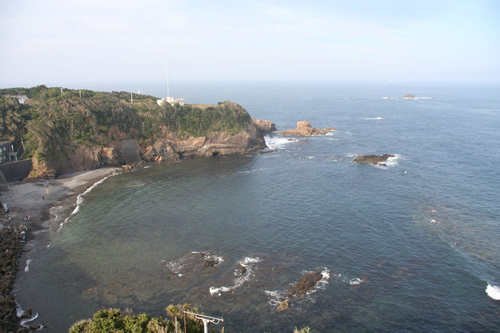 Cape Daio-Zaki, of which frightened sailors sang, “Wishing there were no Kamisaki in Ise, Yoroi in Kuzaki, and Daio in Nakiri,” lies at the southeast end of the Shima Peninsula. It was once known as a rough point jutting into the ocean so that the raging waves of the Enshu-Nada Sea and Kumano-Nada Sea were divided. Thus, construction of a lighthouse had been desired for long time. 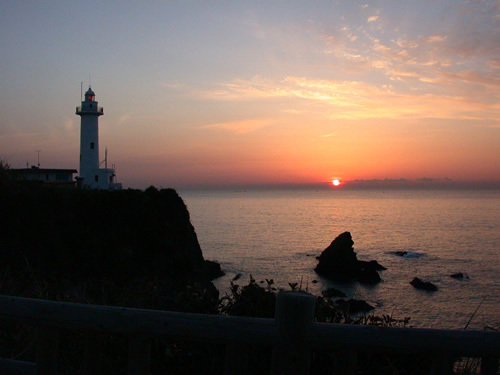 On May 16, 1927, construction started under the authority of Japan’s Lighthouse Bureau (Todaikyoku) and the light was first lit on October 5 of the same year. The cost of construction totaled 36,221 yen 94 sen. The lighthouse survived numerous threats, including the Pacific War and the Isewan Typhoon. Nearly half a century after construction, a major renovation was completed in December 1978. This is the lighthouse that stands today. In April, 2004, a new high-performance radar system to monitor waves automatically was installed in the lighthouse, and the last “lighthouse keeper” in the Tokai District left the lighthouse. 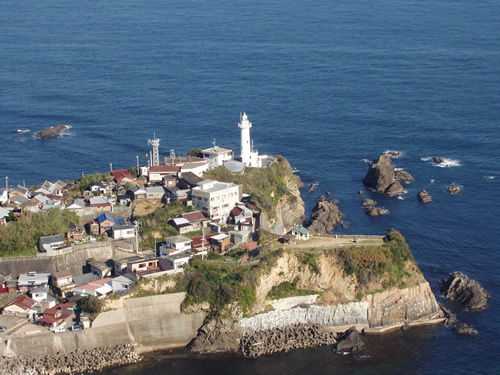 Daio-Saki Lighthouse is a popular tourist spot as a lighthouse open to the public, and continues to operate as an active aid to navigation. Daio-Saki Lighthouse, one of numerous lighthouses open to the public in Japan, allows visitors to go up the stairs to the top. The sunrise from the lighthouse on New Year’s Day attracts a great many visitors every year. Would you like to enjoy this magnificent sunrise with the lighthouse? The chalky lighthouse, located in the southeast of the Ise-Shima National Park, has created the outstanding scenery in harmony with the blue sky and sea. The sea spray heaving against the cliff developed like stairs is quite powerful. Those days, the newly built Daio-Saki Lighthouse After the Great Kanto Earthquake in 1923 was a modern, fine, unprecedented lighthouse with a small, fan-shaped and two-storied house below a circle tower. Do not destroy or damage any goods, instruments or equipment, or take them out of the lighthouse. The lighthouse is an important facility to assist safe navigation. Act with care at all times for your safety. Watch your head and steps when you walk up and down stairs. The lighthouse is tall and the stairs are steep, narrow and very dangerous. Act cautiously, as there are some delicate instruments and equipment considered dangerous when touched. Persons who exhibit drunken or any other behavior considered dangerous by the staff are not permitted to enter the lighthouse. Visitors are not allowed to bring pets into the lighthouse. Take your garbage (wastepaper, cans, etc.) home with you. No smoking is allowed inside the lighthouse. There is no flame permitted in the area. ※We are not responsible for accidents caused by visitors’ careless behavior. the lighthouse is subject to be closed or the open hours will be changed. Copyright (C) Shima-City Tourist Association All Rights Reserved.